Photovoltaic Solar Energy is electric energy produced with photovoltaic panels through a process called Photovoltaic Conversion. It is based on a physical phenomenon known as ¨the photovoltaic effect¨, which converts solar light into electric energy through semi-conducive devices known as photovoltaic cells. These cells are made from a pure silicone base, then mounted in series on solar panels or modules in order to achieve the adequate voltage. The installations that contribute electric energy to the general network are the so-called Installations Connected to the Network (on grid), which produce the greatest economic yield. Those not connected to the Network are considered isolated (off grid) and are used more in areas where there is an absence of electricity distribution lines. As a consequence of global warming, among other reasons, the clean energy industry can be seen as the 21st century’s most profitable business sector. Proof of this is the explosive growth experienced by the industry in the last four (4) years. In this sense, all countries that wish to position themselves as world leaders should, on one hand, establish norms that guarantee not just investment returns to the investor, but sufficiently attractive profitability rates as well, such as those currently offered in Spain, Germany, Italy and France, which hover between 12% and 15% annually; on the other hand, they should focus their efforts on the Research, Development and Innovation of this field, so as to obtain better yields at lower costs. The annual yield calculated for photovoltaic plants of 100 KW/p, is estimated between 10% and 15%. The payback period is placed between 7 and 10 years, depending on each individual’s financing and subsidizing possibilities. However, in order to calculate the exact payback period, it would be necessary to include a study carried out by the investors’ or the company’s Account Inspector, or the Fiscal Assessor and Inspector. 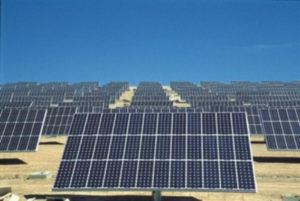 We can develop the design, engeniering and building of any kind of solar power projects, and the maintenance. Also, we can do other projects for energy generation, in renewable energies, as eolic installations, geothermic and biomass. We care all details in the design and engeniering process, to avoid energy looses or reduce them to the lowest. It’s important to dimensionate the photovoltaic modules, the selection of the inversors-conversors with the best eficience, tranformers with low looses, etc. All This is for generate the maximun possible energy in the point of connection. 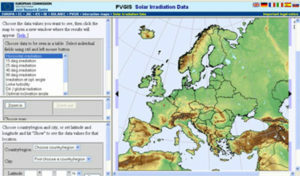 The information about solar radiation come from the European Comission Investigation Center. Our company is responsible of maintenance of the installations, is also responsible for accounting and invoicing of the electricity distribution company. The production target should be reached on the basis of our initial studies would be to reach half of 2100 KWh / KW installed (annual average). This estimate is derived from estimates that rely on monthly hours of sunlight in every season and weather forecasts for each geographical area. The following chart we can see what the evolution of annual production at the end of 2009 KW. 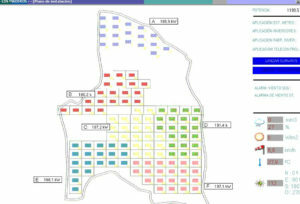 KWh total monthly production in a solar park from the start with the electricity distribution company . To complete the following table shows what the production target for the coming months of 2009 and which products are being achieved in the months that have elapsed since the start that there is data. In the first two months it was below the estimate but once completed the settings in the installation and configuration, as shown are well above the estimates. 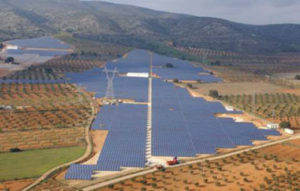 Within the preventive maintenance plan, a part of the technical operations required in the plant site, conduct a quality control through a remote control software via GSM instant production from the plant site in addition to each area or sector of the park solar, in addition to obtaining other data, such as electrical parameters of the investor network, comprehensive control of the solar fans, and even meteorological data of the site to interact with this plant.